It seems like it was just yesterday that Greek banks, which carry some €89BN of bad loans on their balance sheets, passed the ECB's latest confidence building exercise, known as the "stress test." At its core, the Greek plan is the now familiar "bad bank" structure, in which banks get to spin off their NPLs into a separate, government-guaranteed SPV (although in the case of Greece, it is not clear if a government guarantee is all that valuable). The SPV would then be funded by selling bonds to the market. 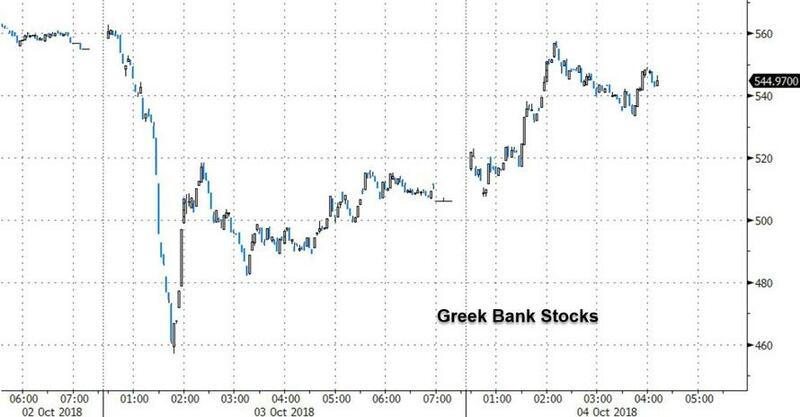 The move came after a furious selloff in Greek stocks, and especially banks, which was the culmination of a YTD plunge which has seen Greek banks lose more than 40% this year amid doubts they can clean up their balance sheets fast enough. The banks, which amusingly all cleared the ECB's stress test earlier this year despite being saddled with tens of billions of NPLs, have been under mounting pressure from supervisors to cut their bad-debt holdings. One person said that it could reduce the load of bad loans in Greek banks by up to 15 billion euros ($17.2 billion) from an overall burden of 88.6 billion euros reported by the four systemic lenders as of the end of June. "The state guarantee proposed for Greece looks quite similar to the one successfully applied in Italy,” said Massimo Famularo, a board member at bad-loan secialist Frontis NPL. And "even though this measure may prove very helpful for banks that need to offload their non-performing loans, it will necessarily involve the placement of junior tranches to private investors, which at the moment may be the most relevant challenge." Still, these challenges will have to be overcome as the whole point of the plan is to shift the liability from the banks, to the government, and ultimately, to the buyers of this exposure in the open market. The bonds would be traded, helping deepen the market for soured loans in Greece, the people said. The state-owned Hellenic Financial Stability Fund, which owns stakes in all four of the major lenders, is in talks with the European Commission to address potential state aid issues, as well as with the ECB’s Single Supervisory Mechanism, the people said. 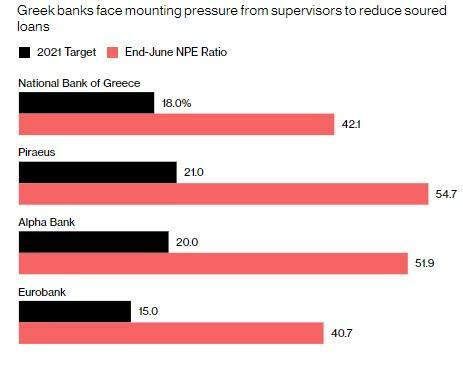 With all other NPL-reducing paths now blocked, Greece may have no choice but to pursue the bad bank approach if it hopes to shrink bank NPL ratios to 2021 projections. After the news, Piraeus Bank SA jumped as much as 13% and was up 9% around noon in Athens trading. Alpha Bank also jumped 7.3% while Eurobank Ergasias SA climbed 9%. The FTSE/Athex Bank Index gained as much as 10%, largely wiping out its Wednesday losses. The plan is far from a done deal; on previous occasions, the creation of a Greek bad bank had been considered and rejected by Greece’s European creditors in the past, even as various similar arrangements have been put in place in Italy, Spain and Cyprus. Under Italy’s program, which was agreed with the European Union in 2016, banks can bundle their bad loans into securities for sale and buy state guarantees for the least-risky portions, provided they have an investment-grade credit rating. The guarantee has helped Italy’s lenders offload a substantial amount of their non-performing loans. It was used in Banca Monte dei Paschi di Siena SpA’s jumbo deal to remove about 24 billion euros of bad loans from its books. The renewed push for an NPL bailout envisages the use of funds from Greece’s post-bailout cash buffer and from private investors to address concerns about state aid, the people said. Leery of being rejected by its offshore creditors, Athens has been mum about the proposal, and a financial stability fund official declined to comment on the asset protection plan, saying that the HFSF exchanges plans and ideas with European authorities on a regular basis according to Bloomberg. Understandably, a finance ministry official said he has no knowledge of such plans.